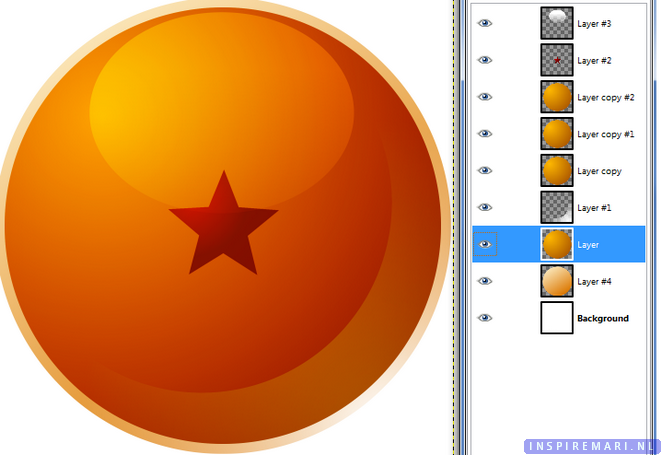 In this tutorial, I will show you how to make a Dragon Ball in GIMP. First, start out by opening a new document. It can have a transparent or white background, whatever you prefer. Make sure it’s square (ex. 500×500 px). Grab the Ellipse Select Tool and tick the box ‘Fixed: Aspect Ratio’. Make a perfect circle on your blank canvas. 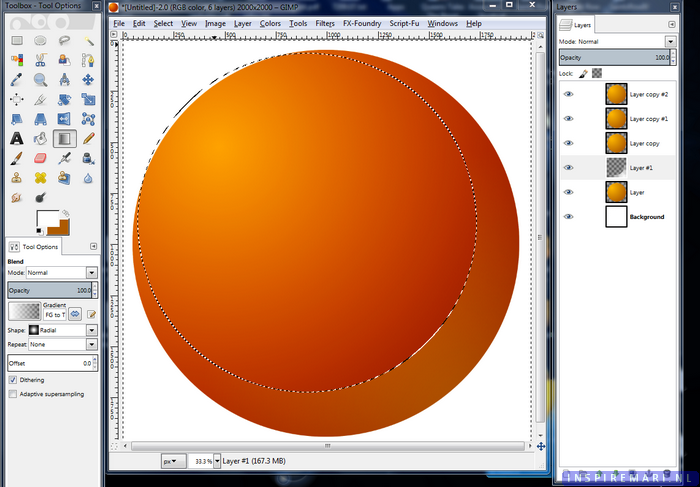 Next, select the Blend Tool and set the Shape to Radial. Use the following colors: ffb900 and ae5a00. Make sure it looks somewhat like the image above. Duplicate the layer 3 times. Set the layer mode of the first two duplicated layers to Overlay. Set the layer mode of the last layer to Multiply. You should have a ball that looks like the picture above. Time to make the ball shiny. Create a new layer above the first layer. We are going to make the ‘edge’ of the circle a little brighter, to give a little gloss. 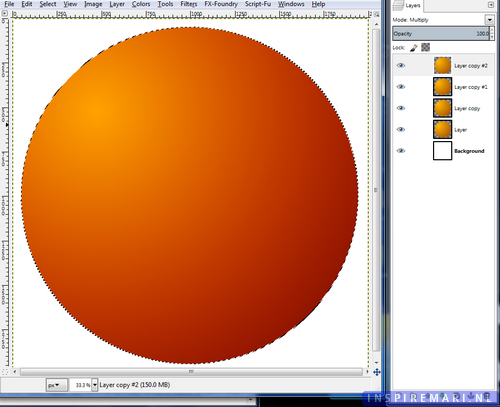 Use the Ellipse Select Tool to create a ball that is smaller than your original. The idea is that you leave some space for the glossy ‘edge’. Go to Select -> Invert. Now you have selected the area outside of the circle. Use the Blend Tool to add White foreground to Transparent background color. 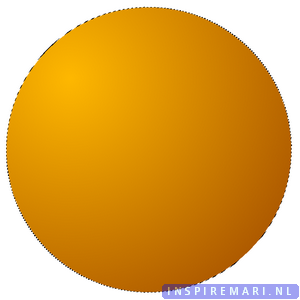 Shape: Radial. See image above. You can duplicate this layer once or twice to make it more shiny if you wish. I’m going to keep it at 1. 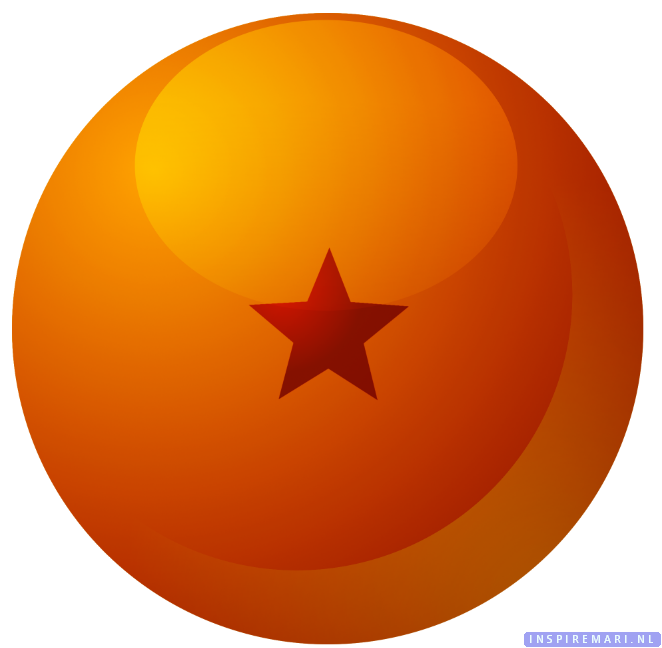 Now let’s add a star to make this ball look more like a Dragon Ball. First, make a new layer and put it above all the other layers. Select the Paint Brush Tool and select the Star brush. Use an appropriate size in comparison to the size of your Dragon Ball. I chose the color d10000. Put the star in the middle of your ball. Right-click your layer and click on ‘Alpha To Selection’. Grab the Blend Tool and add the color 710000. See image above for how I shaded the star using Shape: Radial. I lowered the opacity of the layer to 80% to make the star look a little more ‘part of the ball’. Now it’s time to make our Dragon Ball a little more glossy. Make another new layer and select the Ellipse Tool again. Make a circle (doesn’t need to be a perfect circle, see example above) on top of the circle. Use the Blend Tool with the color White and set it to Foreground to Transparent. Drag your mouse from the top down to fill in the circle. Set the layer to Overlay and set the Opacity to about 70%. This step is optional. You can add an extra glowing border to your Dragon Ball like this: Right-click on the first layer and click Alpha To Selection. While your ball is selected, go to Select -> Grow. Set the number of pixels appropriate in proportion to your ball. Just look at the example above for an idea. Now, with everything still selected, create a new layer under the 1st ball. Select the Blend Tool and choose two colors that are lighter than your ball. I used dc7700 and fff4d0. Set the Shape to Linear. 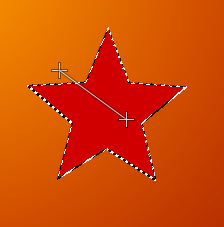 Use your mouse to make a diagonal line and apply the gradient. It should end up somewhat like the image above. 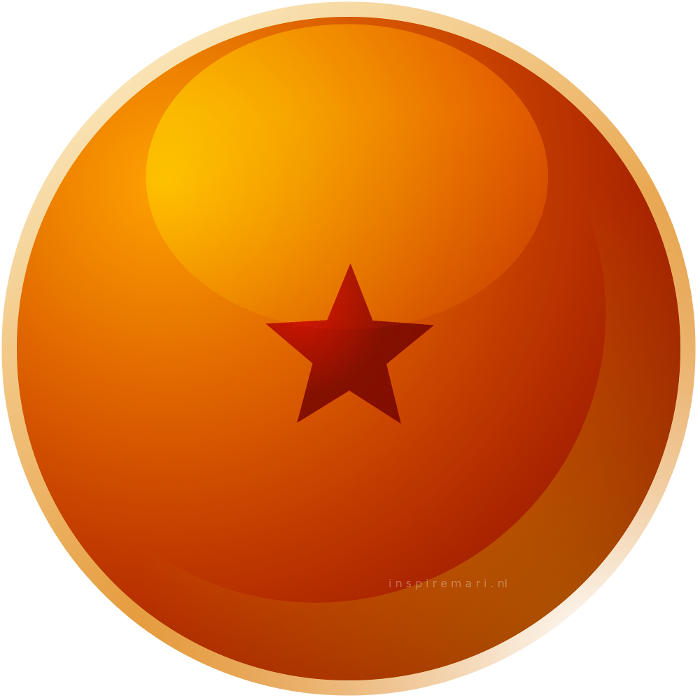 And voilà, here is your shiny Dragon Ball made in GIMP! Have fun!